Last summer I posted a picture of Anolis lineatopus that illustrated why accounting for transmission is critical when addressing questions related to signal detectability. Considering transmission is particularly important in the case of signals, such as the dewlap, for which transmission contributes greatly to the "perceived" brightness of the signal and the sudden increase in brightness, which is known as the "Gelb Effect". 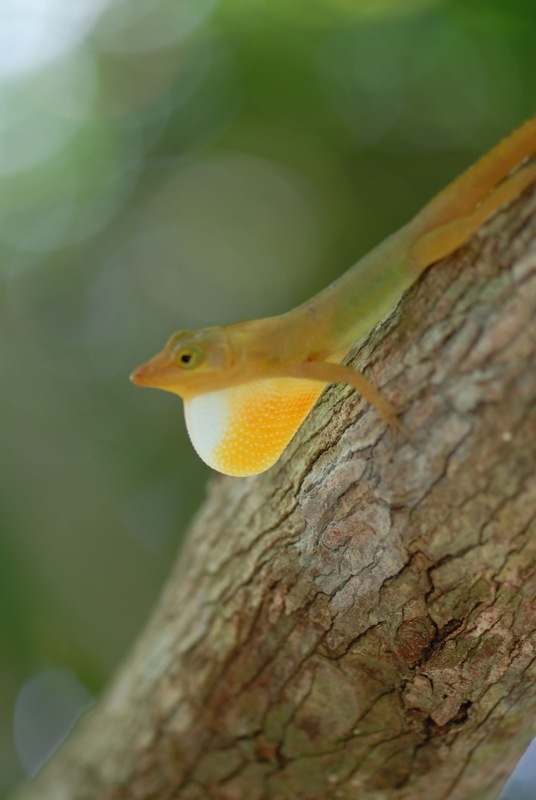 The dewlap of Anolis acutus is also a great example of the "Gelb Effect" as illustrated by the picture below. In A. acutus, the effect is even more dramatic because the white region of the dewlap is at least twice as transmissive as the yellow/orange portion of the dewlap.